A weekly feature, Rubee Tuesday is a recap of my week's adventures in dining and drinking in and around Phoenix. Wednesday, July 27. 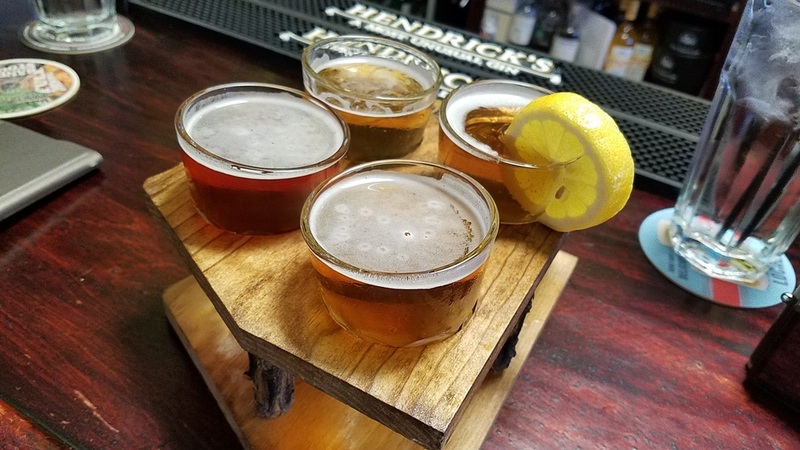 As part of an assignment for an upcoming Scottsdale Visitors Bureau article, I visited Citizen Public House, sampling craft cocktails and some of their signature dishes. Look for that in the printed issue of the fall Vistor Guide. Special thanks to General Manager Steve Faulkner who chose some delicious dishes including grilled octopus with spicy watermelon gazpacho, fennel, and chorizo; hummus and tzatziki plate with house pickles; scallops with roasted corn grits, wilted snow pea greens and cola gastrique; and of course the Original Chopped Salad. Craft cocktails were a Stiggins Fancy Colada (Plantation pineapple rum, Hamilton rum, pineapple syrup, lemon, lime, cream), a Manhattan (Elijah Craig small batch bourbon, sweet vermouth, maple syrup, tobacco bitters), and the Clover Club (Nolet's gin, raspberry simple syrup, lemon, aquafaba, pickled raspberries). Our next stop in Old Town was to help judge a bartending competition at Wasted Grain between two of my favorite people, acclaimed cocktail master Richie Moe and his talented girlfriend Tara Thorpe. Congratulations to Richie for his winning Smoked Maple Manhattan, which is now on the cocktail menu at Wasted Grain. For a detailed recap, follow this link. Our final stop heading home was Orange Sky for prickly pear martini research (the best kind!) for an assignment. A bonus was enjoying the beautiful sunset view with live music by Stan Sykes. Thursday, July 28. Twelve of us were invited for a media dinner to meet Executive Chef Derek Biazo of Deseo at the Westin Kierland for an introduction to his new menu items. What a fantastic dinner! Look for a recap and more pictures by Jenelle Bonifield of Food & Lifestyles in an upcoming feature. I've been wanting to get back to Craft 64, and this visit just solidified what a gem this place is. Their focus is on artisan pizzas, salads, and sandwiches (including a fabulous BLT with mozzarella on house-baked foccacia), sourcing local, and an expansive beverage menu with cocktails, 36 AZ brews, and a 100+ wine list. Next we visited Old Town's newest AZ wine tasting room, Carlson Creek Vineyard, and had a chance to chat with owner Robert Carlson - always a pleasure! Learn more about their recent grand opening here. Our friend George Altatriste is the talented chef at The Mission and he's always enticing me with photos and descriptions of his nightly specials, like this amazing filet with chimichurri mashed potatoes, roasted romesco cauliflower, trumpet mushrooms, and a mezcal-manzano pepper glaze. I'm a native New Englander so when I received the Eddie's House email newsletter mentioning a fried Ipswich clam special for the weekend, that was a must. I've been a longtime fan (see my Happy Hour 2012 article in AZ Wine Lifestyle here), and it was great to be back. We not only ordered the fried clam roll, but the clam chowder was so good, we had two! We also had a chance to talk to Chef Eddie and explore more of the dinner menu, including the best Yankee pot roast in town. Look for a detailed recap on Eddie's House, and the other downtown spots we visited, next week. Sunday, July 31. Bitter and Twisted hosted a "Chiwas Chino" collaboration dinner with Tacos Chiwas. Click on the photo below for a full recap. Monday, August 8. I wound up a great week recording Into the Soup at my house with host Heidi Lee and some of my favorite people in the industry such as Phoenix Bites, Joanie Simon, Food & Lifestyles and Debby Wolvos Photography. Food and cocktails were involved, of course. 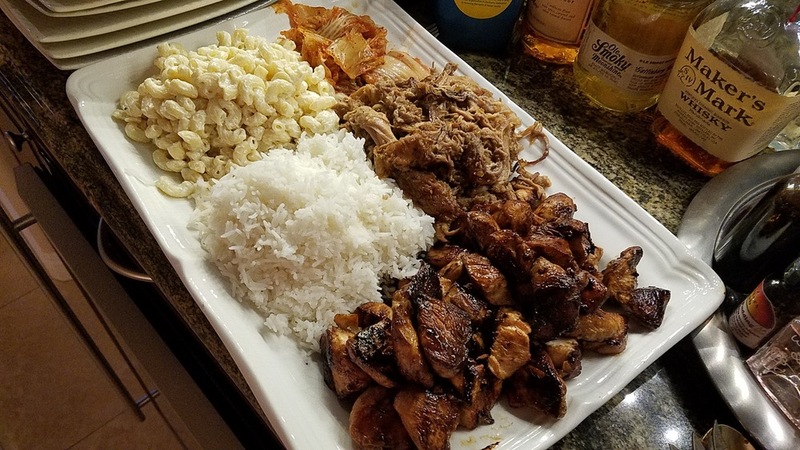 I made Fog Cutters and served Hawaiian Plate Lunch with teriyaki chicken, mac, and rice and Phoenix Bites' husband's delicious kalua pork. Jenelle contributed Arizona wine and Joanie brought a wonderful cheese plate and a decadent chocolate-chile dessert. Thanks ladies, and thank you Heidi Lee for having me on the show! Listen in at noon on Saturday on KWSS 93.9. Check back next week with my plans for Marigold Maison, La Hacienda, El Chorro, The Spotted Donkey, Crab & Mermaid and three more Scottsdale wine tasting rooms - LDV Wine Gallery, Aridus, and Salvatore. To browse past Rubee Tuesdays, click this link.